Whether you’re making a bone broth recipe, homemade stock, or want to try eating bone marrow, properly roasted bones are important for quality. 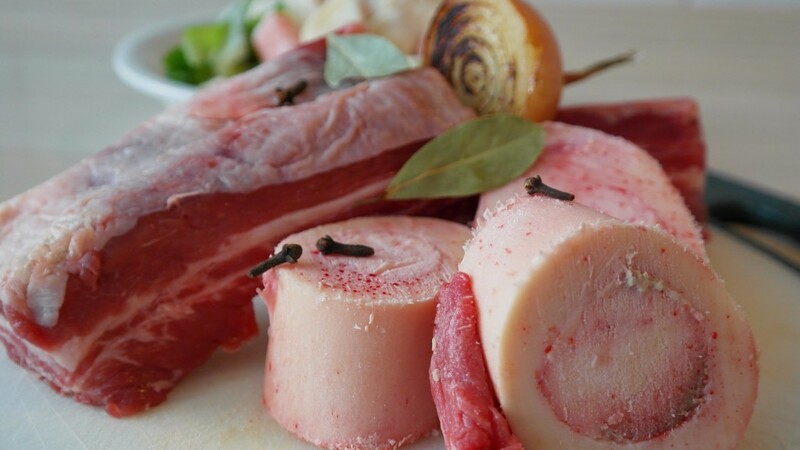 Find out the benefits of roasting bones and how to roast bones for each type of use! As we begin looking at the different building blocks of sauces, today we’re focusing on how to roast bones. This is great if you want to take up drinking bone broths, want to make a thick and rich brown stock, or you want to start eating health-promoting marrow. What Are The Benefits of Roasting Bones? There are many different reasons for roasting bones, both for your stock/broth and for your health. Flavor. Roasting your bones helps to create a deeper, fuller, and richer flavor from the caramelizing of the meat and marrow. Gelatin. The naturally existing collagen and connective tissue in the bones helps make your stock thick and gelatinous. When you add acid to your bones (usually from brushing them with tomato paste) it helps to draw out even more of the collagen to make an even thicker stock. This is great if you plan to reduce it into a demi-glace. Nutrients. As the bones are boiled into the bone broth or stock, it melts in the marrow; this may release many of the marrow’s health benefits (although this is up for debate as there isn’t a lot of scientific backing for it. If you would like to read more, check out this article from NPR). The marrow in bones is not just for food snobs or your dogs; it is packed with lots of quality vitamins and minerals, stem cells, and amino acids. Marrow is believed to reduce inflammation (especially in the GI tract), promote self-healing, improved brain function, healthy skin, and help prevent and/or heal cancer. Marrow is high in healthy fats and is good for promoting a longer lasting “full” feeling after eating. Not all bones are equal! Knowing how to roast bones properly can maximize the health benefits. It’s also important choose bones that have a higher amount of marrow and are from animals that are raised humanely and organically. Properly roasted bones give additional flavor and body to your bone broth or stock. My number one tip for how to make a better bone broth, it would be perfectly roasted bones! Place bones in a heavy bottomed deep roasting pan, or on a parchment paper lined baking sheet and roast in the oven for 30-40 minutes. You want the bones to be a darker color but not burn any residual meat. *The acid in the tomato paste helps dissolve the connective tissue in the bones. It also adds a little extra flavor. When it comes to eating marrow, the best bones for the job come from beef or veal. You can get marrow bones pretty easily from your butcher (and usually very cheap) and they can leave them whole or cut them in half. Either will work wonderfully, but if you get the split bones your cooking time may vary some depending on how thick they are. This does make it easier to get the marrow out, however! You want your marrow to be loose and give a little, but make sure to remove it from the oven before it begins to cook away. Place your bones vertically on a parchment paper lined sheet pan and sprinkle them lightly with salt. Remove the bones from the oven and scoop out the marrow using a spoon or butter knife. Serve as desired: on grilled bread, in a compound butter, with garlic and caramelized onions, with parsley and lemon, straight out of the bone – whatever strikes your fancy. Do you have any favorite tips & tricks for how to roast bones? What is your favorite way to eat bone marrow? Tell me about it in the comments, or show me on social media – @foodabovegold. Make sure to tag it with #foodabovegold so everyone can see your mad skills! My husband and I love pho, so this is perfect. I don’t eat dairy, and I remember finding articles saying that bone marrow broths are a great source of calcium. I will definitely loop back to this post when we want to cook it. Thanks! Hi Janet! I’m so glad you stopped by! You will absolutely still gain the benefits and nutrients of the marrow by making broth because the marrow will dissolve into the broth as it simmers. I sometimes find that I don’t stay as full for as long by drinking the broth versus eating the marrow, but that’s personal experience and will vary for everyone. I’m curious do you add anything to the bones when you are roasting them? or just let them cook on their own? Hi Brian! Thanks for stopping by! You don’t need to add anything to the bones if you don’t want to. If you would like, you can brush some tomato paste on the bones before roasting and this will break down the connective tissue as well as provide a flavor boost. Depending on what you are doing with the bones though, the roasted tomato flavor may not be desired. If you are turning the bones into a stock afterwards (like THIS ONE), your flavors will get added in during the stock making process. I hope this helps. I can’t wait to hear how it goes for you!